With India being a market of significant potential for extrusion machinery makers, especially in flexible packaging, Davis-Standard will promote new technology and regional capabilities in Hall 8 at booth D71 during Plastindia 2018 in Gujarat, India, February 7-12. Among Davis-Standard’s latest developments are the recent acquisition of Maillefer, the company’s growing regional presence, expanded dsX flex-pack technology for extrusion coating, and new stretch film capabilities. The latest dsX flex-pack model is the 300S, which is a single station line with benefits specifically engineered for the Asian flexible packaging market. Design of the dsX flex-pack™ 300S was a collaboration between Davis-Standard’s teams in the U.S., Germany and China to ensure that pricing, machine footprint, speeds and output, and the ability to make shorter runs would accommodate demands of converters. In addition, Davis-Standard will offer a tandem configuration of this machine called the dsX flex-pack™ 300T for the Indian flexible packaging market. Davis-Standard plans to have its first flex-pack 300S available for demonstration in Suzhou by the fall of 2018. Davis-Standard also anticipates its new stretch film line technology with the DS S3 winder to be beneficial to Indian converters. Quality control, versatility and efficiency are hallmarks of this technology. The line offers a compact machine arrangement, ease of servicing, excellent profile control, consistent roll quality and an intuitive control package. 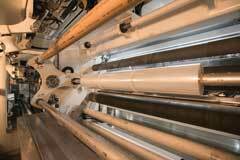 It is engineered for producing thin films from 31-to 51-gauge (7.8µ to 13µ) at high speeds. Davis-Standard’s side-by-side DS S3 overlapping winder is essential to this capability. The S3 winder enables maximum slit widths for hand-wrap, machine-wrap and jumbo rolls, supporting multiple market segments on one winder. Films discharge out the front of the line to a common side to simplify roll packing and future automation. Cores are also same-side loaded from the back to prevent disruption of packing activities. There is an auxiliary lay-on roll to eliminate top-wind waste during transfer, optimizing roll quality and eliminating outer wrap transfer waste. All features are advantageous for high-grade film operations. Davis-Standard’s acquisition of Maillefer in 2017 expanded the company’s wire and cable, pipe and tube equipment offering, and added facilities in Finland and Switzerland to better serve customers, including those in India. Wire and cable capabilities include automotive, building wire, coaxial cable, LAN, fibre optic MV, HV and EHV among others. For pipe and tube applications, this includes automotive, heating and plumbing, irrigation, medical, micro-duct, off-shore and custom lines. The Maillefer addition complements Davis-Standard’s presence in China with Davis-Standard (Suzhou) Plastics Packaging Machinery, Co., Ltd. The Suzhou facility is Davis-Standard’s manufacturing base in China and houses an R&D laboratory for process development and trials. The laboratory is equipped to test a range of rigid and flexible products as well as FPVC tubing for IV & fluid delivery. Applications include Alternate Polymer, microbore tubing, multi-lumen and catheter tubing, endotracheal and tracheotomy tubing, radio opaque tubing, bubble tube, taper tube, pipette tubing and multi-layer tubing, among others. Machinery being manufactured in Suzhou includes medical tubing FPVC and co-extrusion equipment as well as assembly of electrical control panels, extruders and gear cases.